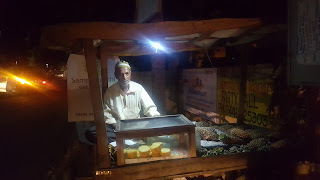 Every day, on my way back home from office, I see this old Muslim man sitting under the lamp post just opposite Manyata back gate 5, making corn! Pausing on the story here, many a times life has taught me a lesson but I just have a habit of making this one mistake again and again and again. My expectations are high, very high. Usually they cannot be matched and hence I can never be truly satisfied. Unless you catch me off guard! I see this as a problem, because I really do like being impressed. Gives me a kick-off adrenalin and a sort of high. Something more of a fresh breath that symbolises progress. This time however the corn was not that great. This made me think, was it the high expectation or was the corn really bad. To get to the bottom of this, I did what anyone looking for an answer would do. I started a conversation with the peddler! I enquired on the difference between the corn he sold me yesterday and the one he sold me today. Now, if I had known the reaction I was going to get from him, my approach may have been different. This one question acted as the last brick on his skyscraper of issues and his deep desire to burst out the pressure of his monetary position to another, already, stressed out individual, me. Having a corn shop in that locality is not a viable business. His potential customers are the ones coming out of partially established restaurants, after a heavy meal. They are not looking for another appetiser. The people who do buy from him are not the sort who could afford sweet corn. They are the people who are substituting the heavy meal with some corn. They are conscious of their pockets and rather settle for the more localised breed of corn. This explained why I did not get another sweet corn. He just got a few dozen to test the market. The new high quality product, with a higher margin, for obvious reasons, failed the market test. It took him over 2-3 weeks to clear the stock. Which tells me, the corn I so liked a lot, was old. Since it was the last one. Yes, makes me wonder, what happen to my high expectations? Maybe, I was just really hungry that day. Anyhow, since then I noticed the man sitting under his lamp post, 5 days a week. But I never bought from him again. Today, as I was heading back home I noticed the corns were gone! He was now selling cut pineapples! This is when I get that breeze of fresh air, that symbolises progress. The man was smart! He knew the basics of a business. Identify who your customers are and get them what ever it is that they want, at a price. I have never seen more people at his shop than what I saw today. Most importantly, I could not find that shadow of the skyscraper of issues on his face. He seemed to be more at peace with himself. It takes a smart person to figure out when something is not working. It takes a wise person to foresee that something will not work. The difference, the latter thinks just a few steps ahead.